The vibe throughout 2017 — white supremacists are “fine” people, the top 5 percent need tax cuts financed by the bottom 95 percent, Vladimir Putin is a great guy — has been pretty ugly. They are wonderfully surreal; at once still and moving, their imbedded energy both contained and flowing around the exhibition space, imbuing it with the creative spirit of their original creators. A woman falls from heights unknown. We see her from below. She wears a blue bikini, marked by red hands on her breasts and red hearts on her pubis. Behind her in the distance, neon rays the color of sunset hours burst forth at dynamic angles into the black nothingness that surrounds them. Within these rays, which seem to emanate from the falling figure, black squares in repetitive patterns, shaped by subtle forms, morph into the shape of buildings and mountains. The woman's arms are stretched out, bracing for impact. She is alone, isolated, in this eternal descent. This is a death fall in the golden hour of earthly beauty. I grew up in the Bronx, not far from Van Cortlandt Park, which is so big it felt like its own country then. I didn’t go into Manhattan often until I attended the High School of Music and Art, years later, though I remember visiting the Metropolitan Museum of Art with my father and seeing a Jean-Simon Chardin painting of a peach, which impressed me because it looked so juicy, so perfect. That was something to aspire to – a representation of a peach so real it made you feel like you were part of the painting. Most of the artworks I saw in those days were reproductions, though; a local paper had a special offer on posters for its subscribers, at 25 cents each, so I bought a J.M.W. Turner seascape for my bedroom wall. The same newspaper offered book deals, so I built up a library – Charles Dickens, Mark Twain. We also had some strange books, like The Cardinal’s Mistress (1908) by Benito Mussolini. I would paint and draw when I was sick in bed, because my mother would bring me all sorts of colouring books and crayons to pass the time. I loved the bold outlines and bright colours of those books. The Crayolas smelled like spring to me. Once a forgotten figure of Pop Art, Drexler has seen a major revival of her career in the past several years. This show focuses on her work since 1986. Rosalyn Drexler, who is about to turn 91, is an unlikely grande dame of painting, but that is what she is. Her rediscovery began a little over 10 years ago when a mini-survey, Rosalyn Drexler: I Am the Beautiful Stranger, Paintings of the ’60s, Pace/Wildenstein, New York, March 16–April 21, 2007, thoughtfully curated by Arne Glimcher, opened at Pace/Wildenstein to wide acclaim. Here was an artist that the histories of Pop Art, with their focus on male painters, had left out. And yet it was immediately clear that such charged paintings as Marilyn Pursued by Death (1963), Chubby Checker (1964), and Is It True What they Say About Dixie (1966) more than held their own with works by Roy Lichtenstein and Andy Warhol, and, frankly, outshone works by Tom Wesselmann, Mel Ramos, and other better known figures. In 2016-17, a traveling retrospective, Rosalyn Drexler: Who Does She Think She Is?, which originated at the Rose Art Museum at Brandeis University, co-organized by Katy Siegel and Caitlin Julia Rubin, helped elevate her to the pantheon of important artists associated with Pop Art. 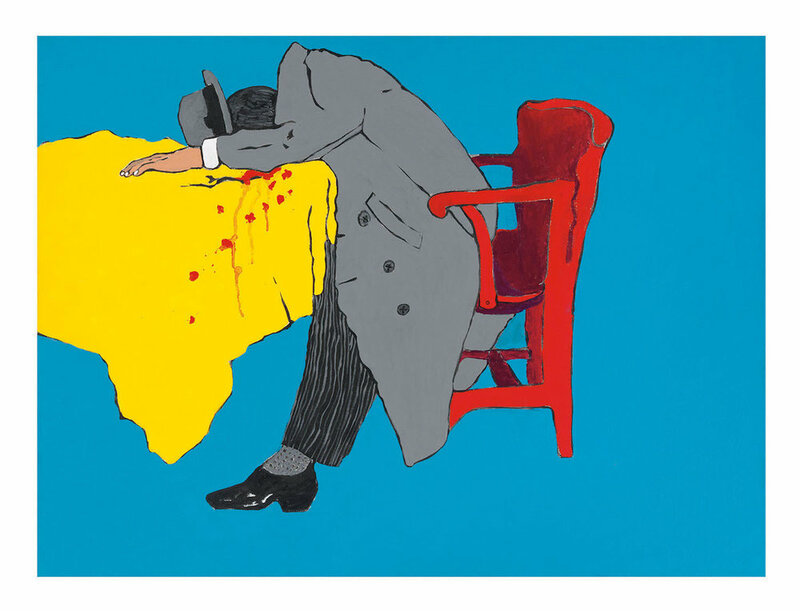 Rosalyn Drexler, known for her politically charged Pop art, has been exhibiting her artwork since the 1950s. In her new show, Garth Greenan is focusing on the more surreal paintings she’s been making since 1986. Many of the compositions feature menacing, often masked figures, an interchangeable cast of criminals, businessmen, and politicians. When I was a child and confined to bed with some illness, my mother used to read to me, often from Robert Louis Stevenson’s A Child’s Garden of Verses. I particularly liked “The Land of Counterpane,” in which a child creates a world of his own. His counterpane (quilt) was the terrain on which he sent his soldiers out to do battle. I, too, created wars—between buttons from the button box: every color, every size, those no longer needed or that were never to be returned to the article of clothing from which they had fallen. I’d race them down my knees, push them from one end of a cardboard shoe-box cover to the other, my young imagination totally engaged. So now I want to return to A Child’s Garden of Verses, to recall the pleasures of being alone: perhaps digging a hole in the sand, looking out a train window, entering a bakery and keeping all the muffins for myself. Speaking of being alone, I’m also looking forward to Jonathan Lethem’s new book of essays, More Alive and Less Lonely: On Books and Writers (Melville House). His use of language and swift changes of subject still delight; his intelligence and knowledge of so many topics bowls me over. I need his humorous and informed take on life. Rosalyn Drexler is a New York–based artist, playwright, and novelist. Still active at 90, Bronx native Rosalyn Drexler was at the center of the 1960s arts scene not only as a painter but also as a novelist and playwright — winning the first of three Obie Awards for her 1964 play “Home Movies.” For much of her creative life, Drexler’s profile has been highest as a writer. But her work as a visual artist is the subject of an exhibition on view at the Mildred Lane Kemper Art Museum through April 17.